Different spa & hot tub manufacturers have different takes on which is best for there tub (120Volts or 240Volts). I have found that in all but the warmest climates 240V is the way to go. This is due to the fact the when a spa is run on 240V the wattage of the heater in most cases is as much as quadrupled, leading to faster recovery times. Also spas / hot tubs that use 120Volt heaters will shut the heater down when the spas jets are run at high speed. This leads to more heat loss during usage. Typical electrical requirements are (but may vary with different equipment - so check with your dealer for specifics): 120V 20amp systems, require a Ground Fault Interrupter (GFCI) which is in many cases supplied with the "plug in cord", from the spa dealer. With these systems it is worth noting that the electrical plugs in many houses are for a 15amp outlet and may not be "dedicated" (where that are no other outlets or appliances on the line). And thusly may require an electrician anyway. Without the usage of proper circuitry you may not only void your equipment warranty you may be causing a fire hazard. 240Volt 30, 40 and 50 amp systems, Spas / hot tubs that use 240V only in their operating systems will generally be wired with a three-wire 240V run. But keep in mind that many spa manufacturers will use a four-wire system, especially if they use a 120V ozonator, pump or air blower. All of these will require a proper amperage GFCI and should only be wired by a licensed electrician. One hint when looking for an electrician is to ask if they have ever wired your particular type of spa. Many good electricians have not wired a four-wire spa and can easily miss-wire the GFCI causing it to trip when power is first applied. 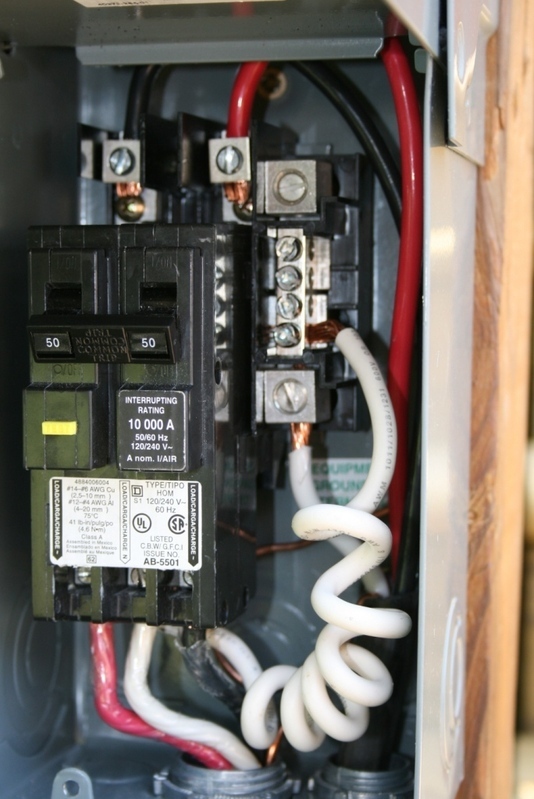 It is a good idea to see if the spa dealer you are purchasing from has anyone on staff that knows how a four wire GFCI should be wired, so if the electrician has problems, they can speak with someone on staff to clarify the procedure for them. Many spa manufacturers that use this type of electrical hookup will have someone on staff that the electrician can speak with directly, if problems occur. Always consult local electrical code, before wiring a 240V tub, this will keep confusion down to a minimum over issues like size of wire to be used, etc. When in doubt, put in heavier wire! Always use all copper conductors, the money saved by going to aluminum or copper coated aluminum, will be lost in increased power bills, and in some cases the cheaper wire can be a fire hazard, and/or will void portions of your warranty. In new spa / hot tub installations it is a common problem to have a miss-wired GFCI. NOTE that there are different models of GFCI used in the market, the following description is generic. To properly wire a GFCI on a four wire 240V installation, when using a sub-panel box, all four wires should be brought out from the main box. The two hot legs should be attached to the GFCI breaker at the proper locations, then come out of the GFCI breaker and be run to the spa. The neutral leg from the main box should come out and be attached to the neutral bus located on the side of the breaker. The neutral pigtail on the breaker should then be attached to the other side of the neutral bus. There is a location for another neutral lead that goes out to the spa from the breaker, this neutral wire should be run out to the spa. The ground wire from the house and ground from the spa should be bonded together in the sub-box. If the neutral and ground are not kept separate in this fashion the spa will instantly trip the GFCI breaker. See the instructions that come with the GFCI for additional information.